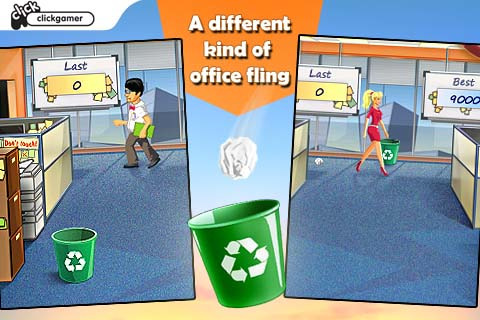 Office Gamebox, released by Clickgamer, is available on the iPhone, iPod touch, and iPad for $0.99. Yes, Clickgamer, the same Dev team as Angry Birds. Play 3 different games based on office competition! No, not who can drain the water cooler faster. Toss paper into trash cans to show off your accuracy! Jump in a chair and avoid obstacles while destroying thousands of dollars of office equipment!! Throw Penguins off a roof to see how far it can go– hey wait, what? When I first started up Office Gamebox, I had no idea it was by the same makers as Angry Birds. It just didn’t occur to me. That was surprising because by first impressions alone, the game seemed to be a lazy, amateurish, and weak minigame app. Thank goodness I kept playing however! I don’t know what compelled me to continue playing the game but as I played each minigame, things changed. Artistically, this is a mixed design. The characters feel a bit awkward in terms of proportions and design. The women look semi-realistic but with Barbie-esk proportions; the men all have giant heads and a cartoony figure. Environments are quite good actually with an excellent design for the carpeting (yes, the carpeting) to make it visually attractive, the office equipment are all recognizable, and the colors and shading are excellent. The first game I ran was the paper throwing game “Paper Sniper”, which is similar to Paper Toss. Fans alter the power and range of your paper ball throws and to play, you flick your finger in the direction you hope the ball will go. The fans give you a numerical representation of its power, but it really doesn’t matter since you’ll never be able to predict your tosses since the baskets change position ever 3 tries, the wind changes every try, and your finger flicks will never get the exact results you wanted. It’s trial and error that never evolves into a game of skills. Over a few games, this is still, in my opinion, the app’s weakest entry. Not a great first impression, but it looked the best overall. The second game is the Chair Race. You straddle an office chair equipped with a fire extinguisher that acts as a jump booster. The controls are as simple as tapping the screen to jump and double tapping to jump twice and gain a higher elevation. In your way, you have pianos… because office buildings have those, couches, stairs, filing cabinets, and other actual office equipment. This is actually a pretty entertaining and easy game to just pick up and play. With the double jump, the first section is pretty easy, but by the 4th and up, the game gets very fast and timing your jumps evolves into a more complex “prediction” timing game. I liked it a lot. Finally, we have the Penguin Toss game “Pitch a Penguin.” I have no idea where the idea of penguins mixed with coworkers in an office doing things to make the time go by. This game is absolutely outrageous in both a good way and a bad. 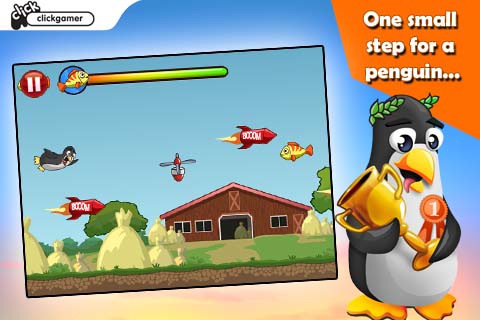 You first start by tapping once to make the little office guy start running, penguin in hand. You tap again to start a charged throw but keep in mind you are still in your running momentum. If you wait too long, you’ll fall off the roof and presumably -die-. If you throw with the maximum distance and speed, you can launch a penguin into the sky… where it will presumably -die-. This is a distance game of course. The sky is littered with floating fans that keep your penguin a float, flying fish that give your penguin strength to… fly… I guess, and rockets that launch it further. I can’t imagine animal rights activists liking this one, but overall, this was, hands down, the best game of the app. I actually had fun with Office Gamebox. The Chair Race and the Penguin tossing were actually interesting to play because the more time you spent with it, the more it evolved and the better you’d do in the next game. My first impressions were shaky on this one, but luckily, Office Gamebox just has a way of getting you to replay it. I would throw the first game away however and replace it with more games. Come on, how many games have we played in a boring office building? Pencils on the ceiling? Water Cooler conversations? Copy machine that needs to die, Office Space style? Boss that has TPS reports for you to fill out so you have to defeat him with excuses and counter his boss powers? Come on Clickgamer. I know you can do more than just 2 decent minigames. Maybe I’m just expecting a bit more from the creators of Angry Birds. Come on guys, we all know you got talent. Wow me. AppSafari review of Office Gamebox was written by Joseph Ho on March 31st, 2011 and categorized under Action, App Store, Games, Mini Games, Platformer, Racing. Page viewed 4324 times, 3 so far today. Need help on using these apps? Please read the Help Page.